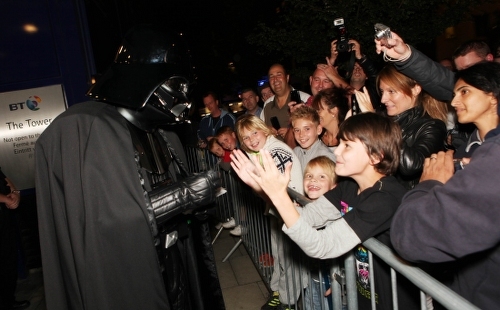 LONDON, UK (September 16, 2011) – London felt the force like never before last night as the iconic BT Tower was transformed into the World’s Largest Lightsaber™ to celebrate the Blu-ray release of Star Wars: The Complete Saga. 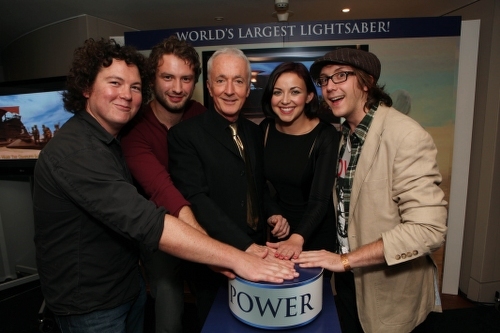 On Thursday 15 September at 8.30pm, from inside the exclusive star-studded launch party at the top of the BT Tower, Star Wars legend Anthony Daniels (C-3PO in all six episodes) pressed the button that lit up the London skyline for one night only as the Tower morphed into Obi-wan Kenobi’s elegant weapon of choice, projecting a giant ‘blue ray’ of light from the top. 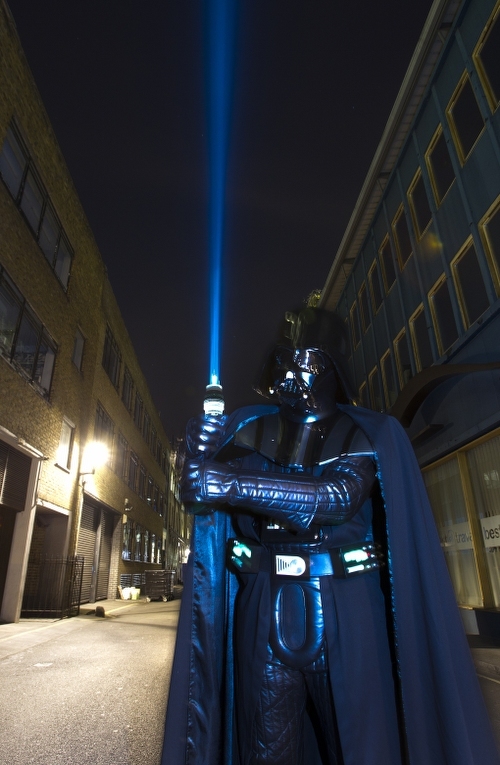 The state of the art lighting transformed the BT Tower into the World’s Largest Lightsaber™ projecting the beam of light 200m in the air from the 189m high tower. A total of over sixty 4,500W lights, standing tall at 1.3m high, weighing 124kg each, all combined to produce a staggering parallel blue ray that was witnessed across the capital. 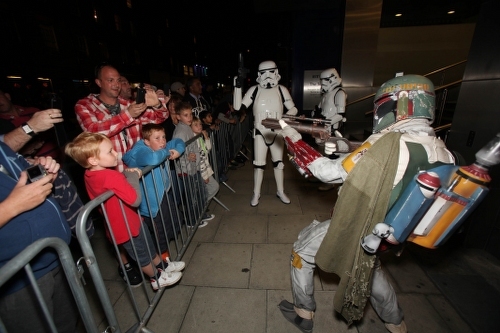 Other celebrities who attended on the night included Star Wars legend Warwick Davis ‘Wicket’, singer Charlotte Church, The Guillemots’ front man Fyfe Dangerfield, Snow Patrol’s Paul Wilson, presenter Mark Dolan, Made in Chelsea’s ‘Cheska’, presenter Gail Porter and no shortage of Stormtroopers and other iconic Star Wars characters including Boba Fett, R2D2 and Lord Vader himself. 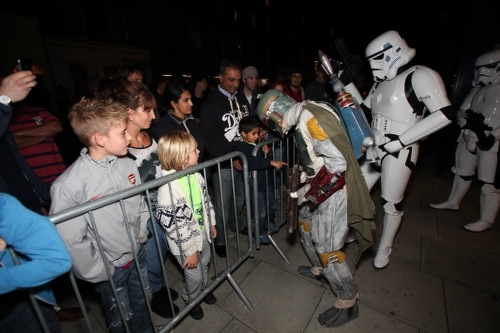 As a fitting climax of Star Wars Week in London, in the words of Darth Vader himself, it was “a day long remembered” by Star Wars fans in the UK and across the world. Relive the unforgettable moments and experience the spectacular adventure of STAR WARS The Complete Saga in a way only Blu-ray can deliver. This incredible collection unites all six Episodes together for the first time in stunning high definition with the purest digital sound in the galaxy. With over 40 hours of thrilling special features, including all-new content created exclusively for this release, you can journey deeper into the Star Wars universe and discover more than ever before. 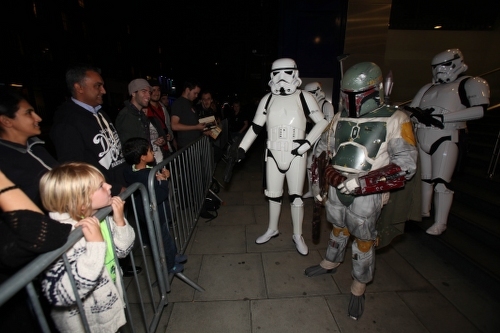 Feel the Force of STAR WARS The Complete Saga on Blu-ray available now!